So much for last year's resolutions.... A whole year has disappeared and it’s time for another update. Honestly, I really meant to keep up with this. … Maybe starting now, I will. The 2.8cm (that’s 1.1 inches to Americans) football shaped kidney stone I had a year ago is history.. if you wondered. it was plugging the outflow of my right kidney and threatening to shut down the kidney if it completely blocked it off for more than a few hours. Just one lithotripsy, though, and it was gone. The only bad side of it was that it apparently contained Enterococcus Faecalis, a really nasty antibiotic resistant bug which put me into the hospital for 5 days. Once busted up by the lithotripsy the bugs went wild and really buggered up my life. I have to give big Kudos to Flagler Hospital and its doctors for their effectiveness in finding and eliminating this threat to my life. Had this happened out in the vast expanses of the great NorthWest I could not have survived. The slow recovery took a number of weeks but I am back and better than ever. We went back to Raleigh in September for a few weeks. We needed a "kids fix" and despite a really major effort by Emery and Christi, we still had a lot of unfinished "basement" stuff to deal with. After more than 2 years of research and procrastination we hired Blue Moon Estate Sales to get rid of it. They took 35% of the gross as commission but it was well worth it as an auction would have taken 50%. We got more than we had hoped for by a large margin. Emery and Christi are doing well and have made really great improvements to the house and yard. As I write this, they are building a nice retaining wall along the driveway to finish up the major exterior home improvements. They have repainted the whole house and we love what they have done with the place. Work has really picked up for Emery since the middle of 2012 so he is staying very busy and we appreciate every moment of time and effort he and Christi spend to maintain the house. Randy and Shawna have moved from Raleigh. Randy got a job offer from Volition Software in Champaign, IL and started there December 2012. Although he was never unhappy at Red Storm Entertainment he felt he needed a broader industry experience base for his career growth. So far, it has been a very positive move for him. 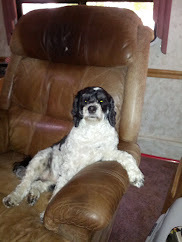 Katie-the-Poo is doing great, seems happy and her seizures are averaging about one per 50 days. The Zonisamide Seems to keep a good balance without making her a zombie or hyper. Usually one per day is enough. We are still living in the Stagecoach RV Park in St Augustine, FL and loving it. The weather has consistently been milder (year round) than anywhere north, west or south of us. Merrily's Brother and his wife are doing well, just completed a downsizing move of their own and her cancer seems to be controlled. It will take 3 clear PET scans that show no sign of any latent cancer before they will say she is in remission but she has had 2 in a row so maybe by her birthday in July, she will have great news and can finally move on. Last summer, while in Raleigh, we traded our 2009 Smart Car for a lease on a 2013. Though nothing was wrong with the 2009 the warranty was gone and it had 46,000 miles on it so all maintenance was going to be on us. The 2013 rides better, shifts smoother and has a 4 year / 50,000 mile warranty by Mercedes so this is a significant comfort factor for us. Our monthly payments also dropped $115 and it is identically equipped to our 2009... plus Cruise control!!!! That is a real biggie to us. Carol has gotten a big boost at work and is very excited. It will involve a move from Raleigh to Charlotte, NC, and since Samantha is just graduating to Middle school the timing is very good. Other than being very, very busy, their lives have settled down enormously in the house they are currently renting. I know another move will be a lot of work but it sure sounds like it will be really worth the effort to make it happen. Smith has now become a member of the million mile club. He is rolling 1 million miles of over the road professional driving for TransAm Trucking. He still loves the work, has stayed employed and now is getting good miles every week so he has paid off all his debts. He is looking forward to actually having a little money to spend on some electives.... after they get the roof on their home fixed. Moving forward: We are preparing to head out for the Pacific NorthWest in about a month. We will stop in Raleigh for a week or so then pause in Champaign to see Randy and Shawna before heading straight for the Rocky's. Our plans are pretty loose but basically involve seeing Glacier National Park and points west. Just how far we can go and how much we can see will depend on how much good weather we have left this year as well as how the money flows. Obviously, the cost of fuel is a huge factor and since we have some interest in spending a few years out that way we need a place to winter in the RV without driving all the way back to Florida or even the Texas coast. We have been looking at the southern Oregon Coastal area, sometimes called the banana belt, as an area that should be mild enough. According to Sperlings Best Places to live, it appears to have about 30% less winter overcast and rain than even 100 miles farther north. This we will play by ear depending on how our summer goes. Merrily has a cracked molar and is getting a crown in a few weeks. I also need to fix 2 slideouts that are dragging / hanging up. I need to put in a new Fuel Temperature sensor on Clifford, too. Once these niggling little annoyances get cleared, we are gone for awhile.... Hopefully, I can get all of these cleared up while we are in Raleigh.